Featuring: Martin Freeman, Ian McKellen, Richard Armitage, Orlando Bloom, Luke Evans, Evangeline Lilly. 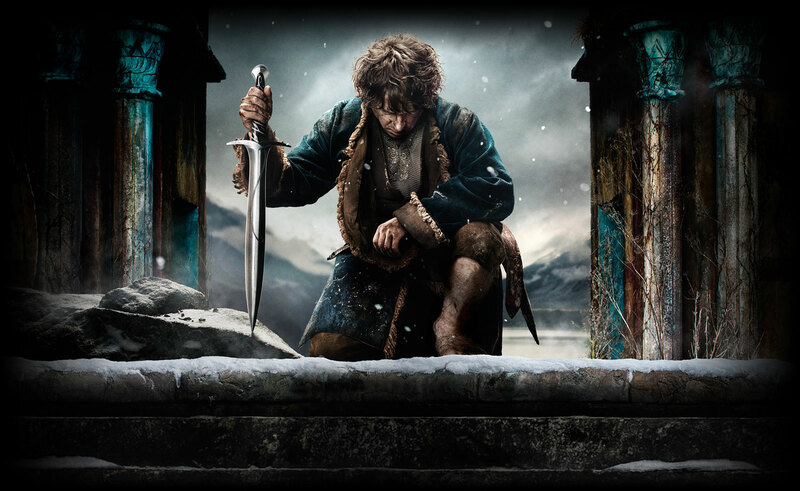 Peter Jackson brings us an early Christmas present with the final instalment of ‘The Hobbit’ trilogy. Although, the fact that the director felt the need to make ‘The Hobbit’ into a trilogy still irritates me and ultimately makes the films less enjoyable for me than the timeless ‘Lord of the Rings’ films, I will focus on the positives of the third film in this review. We were left at the end of ‘The Hobbit: The Desolation of Smaug’ with the start of the climactic scene where Smaug, the fire-breathing dragon (voiced by Benedict Cumberbatch) leaves ‘The Lonely Mountain’ and flies towards ‘Laketown’ to destroy it. Peter Jackson claims that this was “just an opportunity” to leave the audience on a cliff-hanger, and therefore set the final film up with an exciting and destructive climax, and that he did! Whereas the first two films were very slow and rather plot and character building focused, the final feature had it all; epic battle scenes, heart-breaking moments, and in general, more of a blockbuster feel to it, like that of the Lord of the Rings trilogy. Through the journey of Bilbo Baggins (Martin Freeman), to the downfall of Richard Armitage’s character (Thorin), the film covers several key stories in the transition from ‘The Hobbit’ to the ‘Lord of the Rings’ tales. My particular favourite cases of this were Legolas (Orlando Bloom) and Saruman (Christopher Reed), and how he set these two characters up for their next movements in the sequential films – but I’ll leave that for you all to see! So, that’s it! The tale of two Hobbits (and multiple other characters obviously) has been fully told on the big screen! In hindsight (assuming they were going to be a success) I would have preferred to see The Hobbit films produced first, then followed by The Lord of the Rings trilogy, but unfortunately, I can fully understand that Peter Jackson felt as though he needed to test the latter out first with the cinema audience before he could warrant creating a cinematic experience of the original story. However, if you are fortunate enough to be watching them, for the first time, in sequential order, I do envy you, and if you haven’t even started them yet, well you really should get watching! I unfortunately only watched this film in a normal 2D format. It was great to watch, however I feel as though an enhanced IMAX version could have made this film even more of an experience! I am never really convinced by 3D – in fact there are only 3 films, which I have seen, where I would say 3D was a must (Avatar, The Amazing Spider-Man 2 & Gravity), but I guess without witnessing, I cannot judge for this film. Recommendation: If you’ve watched all of the Lord of the Rings and Hobbit films so far, or alternatively you’re watching the Hobbit films first, then a must see at the cinema! Possibly pay the extra for the IMAX experience, as always these films are beautifully shot and worthy of IMAX clarity.